Are you looking for a Six Guns alternative? Offline or in small size? If yes, West Gunfighter would be the best option for you. It’s completely similar to Gameloft’s Six Gus game. 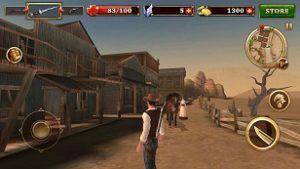 Check out our West Gunfighter cheats, tips, tricks and guide to play West Gunfighter like pro cowboy! 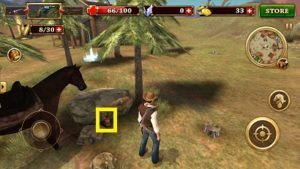 As usual, the game starts with a tutorial in which you learn about the basic of the game; how to play West Gunfighter, about the shooting, quests, horse riding, and much more. After the tutorial, you enter the town and play manually. Let’ start the West Gunfighter game guide first and then read West Gunfighter cheats, tips, and tricks to earn diamonds, coins, boosters, and much more. 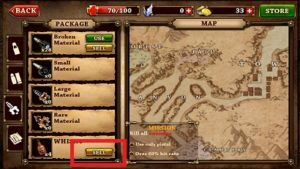 Playing it is really simple; you just follow the red location mark on the mini-map, interact with people, accept the quest and complete the quest to earn precious rewards; coins, gold, and much more. Use the joystick to control the character. At the bottom-right corner, there is a fire or attack button. Just above it, there is a horse icon. Tapping on the horse icon will call the horse. At the top-left corner, you can switch your weapons; use navigation keys to switch between weapons or buy ammo. Just below the weapons, there is a quest icon, tap on it to check the quests. There are three types of quests; main quest, side quest, and the daily quest. Completing these quest reward you coins, diamonds, and much more. Your health is limited, if the character has been injured during the shooting against enemies, heal it by using HP potions. Tap on the mini-map, look at the left side, head to the potion section -> there you will see HP potions(vital), tap on the use button to use those potions. In West Gunfighter, you can buy these HP potions in exchange for coins under the shop section. Just tap on the mini-map and follow the path. Use the horse to go to these places quickly. Whisky bottle is one of the precious items in West Gunfighter game. You can sell it in exchange for diamonds. And as you know, diamond used in buying new weapons, horse, and outfits. Whisky bottles can found in the cave, forest, jail area. Just explore the area, look at behind the rocks, inside the house, near trees. Once found, shoot it. Now, how to convert it into diamonds? I mean how to sell Whisky bottles in this game? Tap on the mini-map, look at the left side, there are some sections; ammo, HP potions, material, and skins. Go to the material tab and tap on the sell button next to Whisky. Choose the quantity and confirm. 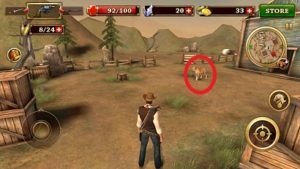 In West Gunfighter, you can hunt animals such as Fox, Deer, Wold, Bear, and Jaguar. After shooting them down, you will get their skins. Sell the animal skin for coins. Animals can be found in the forest, jail area, and in town. Don’t miss them. Just Shoot down! In the West Gunfighter game, to deal more damage to enemies and animals; you should have to upgrade the weapons. Upgrading a weapon requires material and coins or diamonds. You can get material/parts from the chest, by hunting animals, shooting down the enemies. Go to the store – weapons – on the left side – upgrade(just below it, use the navigation keys to switch between guns). You can buy these clothes from the shop in exchange for diamonds and coins. Sometimes you get HP potions, material, coins, and other rewards by shooting people in the town. Shoot them and you could get a decent reward. To deal more damage the enemies, go for the headshot. In every shooting game, the headshot is the best shot you can shoot. Complete the quest to earn a huge amount of coins, diamonds for free; quests; main quest, side quest, and the daily quest. Go back to the main screen -> achievements -> claim the achievement rewards.